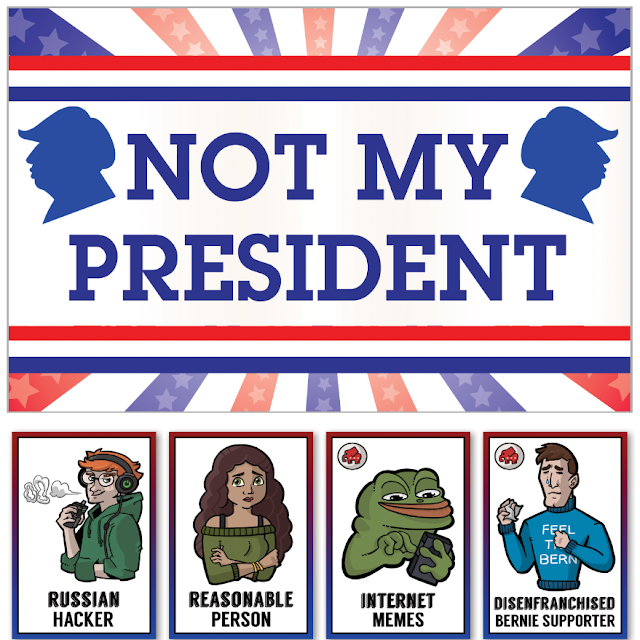 The story of our game began when several people in our rock-climbing circle got together one evening and designed ‘Not My President,’ a satirical game to provide some comic relief to the unpredictable political climate. 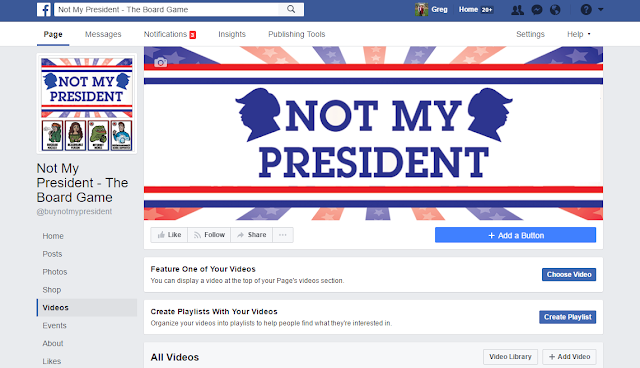 Our vision for the game centered on the most recent election cycle and aimed to poke fun at all the lunacy on both sides of the aisle that erupted leading up to November 8th. Even the major focus of the game, finding the secret trump supporters, makes light of people hiding their political views. The idea for the game, Not My President, sprung up while several of us were playing the social deduction game ‘Werewolf’. 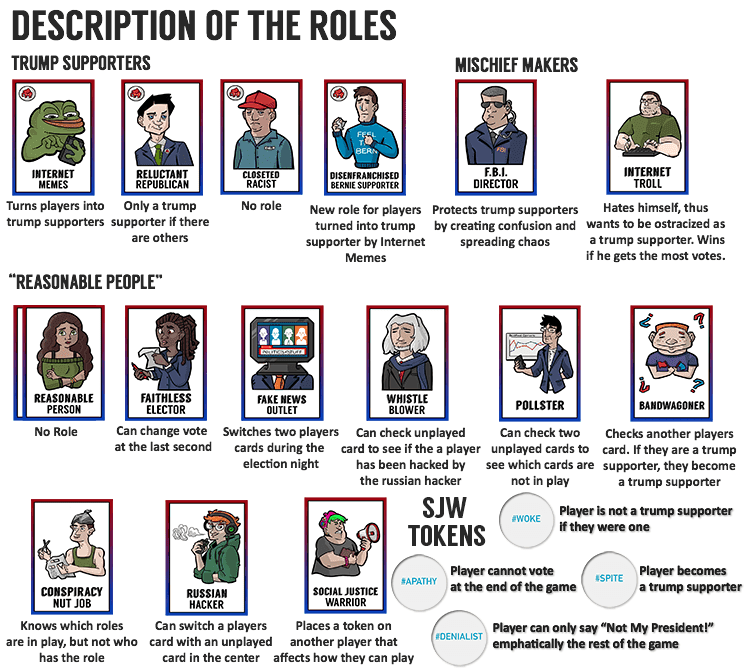 The game centers on players either assuming a "Villager" or "Werewolf" role card. The "Villagers" try to figure out who among them are the “Werewolves” while the werewolves try to disguise themselves as villagers among the group. We started cracking jokes that it would be hilarious if, instead of finding werewolves, we were looking for Trump Supporters instead. The concept blossomed from there to include all the strange and unpredictable events that happened during the previous election and how people sometimes even needed to hide their political views. In order to make the game we knew all of the characters needed to reflect a trope from our current political climate. We grouped up and started listing out random character ideas that we thought would fit, i.e. the fake news outlet, the internet troll, the reluctant republican. 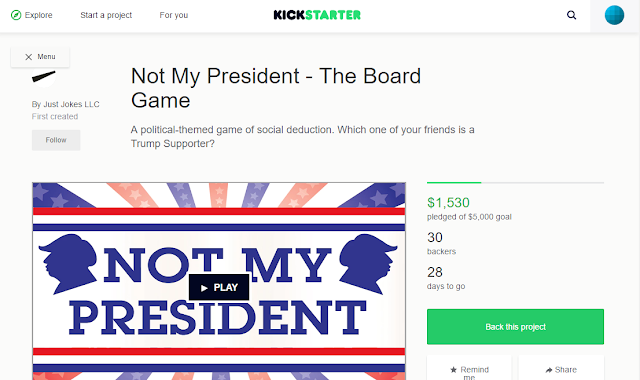 We knew that we wanted our game to resemble a satirical version of other social deduction games. So we decided to try to make fun of every group equally, both the right and the left. 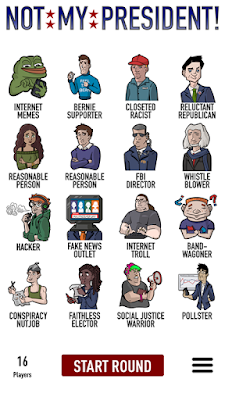 In the end we settled with the 4 “Trump Supporter” roles and 12 “Reasonable People” roles seen below. 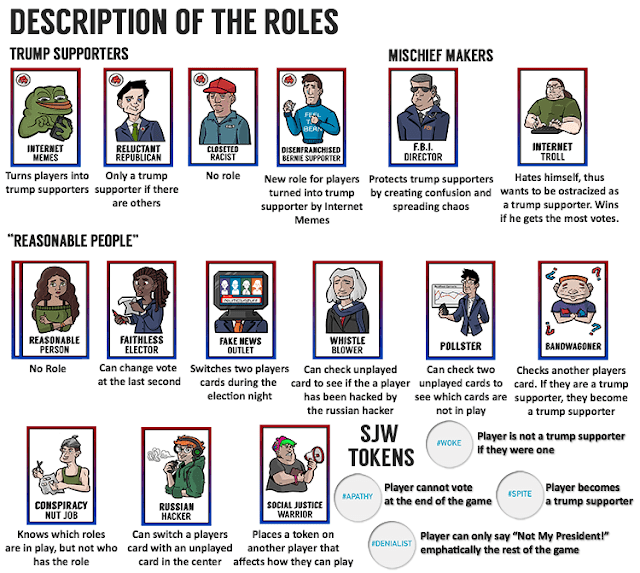 We thought that by making the “Trump Supporters” the hidden role in the game, it would accurately reflect the trope on the social witch-hunt that happened/continues to happen in America. 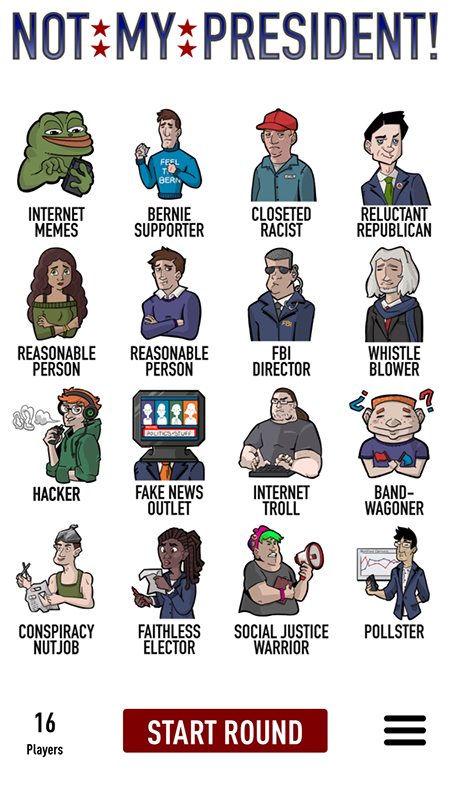 To make sure we made fun of both sides we made the “Reasonable People” equally ridiculous in that each character is a stereotype on a left extremist view. Now it was time to give each character an ability that suitably matched their name. After long hours play testing and designing characters we settled on a set that played well. Honestly, it played more than well it was actually incredibly fun. We were frankly surprised, as the game design really started off as satire, but the roles worked together seamlessly from a thematic standpoint and mechanically. Each game laughter would erupt as players were forced to chant “Not My President” or accuse someone of being fake news or sit there nervously deflecting questions….only to reveal they were an internet troll the whole time. The experience was great as we could adjust any unclear rules in real time to see what worked the best. Also with having such a diverse group of friends we could find out what was actually funny and was strait up offensive which helped us curve the game to being fun for the whole group. One major issue we found during playtesting is that people kept forgetting what characters were in play. We would have to stop the game and write down all of the characters in play before continuing. 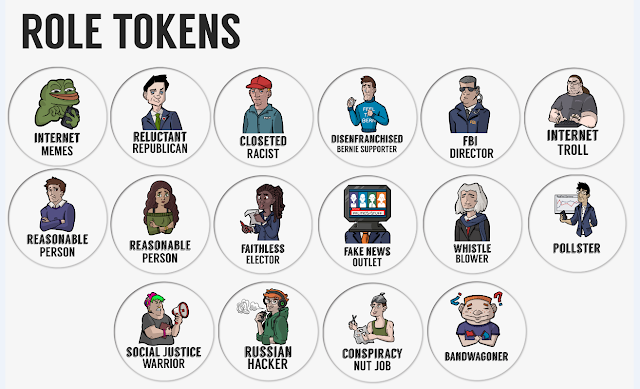 That’s when we decided we needed tokens of each character in our final game so that we could easily remember what roles were in play. After playing a couple of games with a human narrator we could tell nobody wanted to do that job. Nobody wanted to be a bystander and everybody wanted to be some funny role. 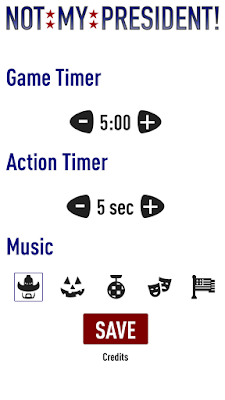 After a few more long nights we were able to put together a functioning iOS app to narrate the game for us. The only thing we were missing was a voice that could sooth the ears and reminded everyone of America. Unfortunately none of us were blessed by a voice that could be described as more than tolerable. We began reaching out our friends and quickly lined someone up. He sings opera in his spare time and does one hell of a Trump impersonation. We recruited him into recording a few lines and our narration app was launched. At this point we were stoked with all that we had made and decided that we needed a wicked artist to bring all the characters together. We again reached out to friends and family until we got a solid suggestion. I think something surprising to us was how much reaching out to those near and dear helped. Everyone we reached out to was so excited to put in their little piece to bring the game off the ground. As you can see the resulting art was amazing. Every time she would send us a new character we couldn’t stop laughing. IIn order to make this game a reality we knew that we had to drop some actual cash. We decided to contact 7 different manufactures to see if they could do the job. The big question was who was cheapest for the best quality, CHYNA or the U.S.A. Very quickly we learned the answer China. For the small scale that we were looking to produce at there was just no way to make a game of this quantity in the U.S. After contacting 5 companies in China we finally found one that could suit our needs. After talking with them for a couple of weeks we found that we needed around $5,000 on KickStarter to fund our game. This was much more manageable than the $10,000 we were being quoted else where. As a piece of advice for other people looking to publish their own games, make sure you contact at least 5 different manufactures and don’t get down by a high initial quote that you may receive. I went back and forth at least 13 times with one manufacturer until I could get the price point to something manageable. Manufactures want you to succeed as much as you do, so make sure to work with them like a partner. 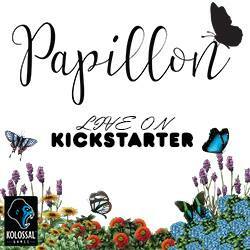 The time finally came, 4 months after conception, to start working on our KickStarter campaign. We divided up roles, like any presidential campaign would. One of us was in charge of everything logistically, such as cost analysis, budget, and shipping costs. He even made our KickStarter video in blender which allowed us to have a simulation of the game being played virtually. 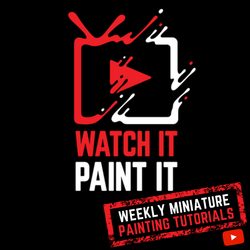 Another was in charge of everything visual on the KickStarter. Banners, stretch goals, game manual, token artwork you name it he made it happen. I took on the marketing and set about finding different avenues to show off our game. The main outlets I choose were Facebook and Blogs, apparent as that may seem I just thought I would mention it anyways. I have also just started taking the games to board game meet ups as I want to see peoples reaction to the game. So far I have managed to not offend any one too seriously! What is great about being a graduate student is that there are so many resources at my disposal. I learned that many business major students have a project where they partner with a local company and help out their marketing goals. After just a 10 minute conversation I learned that I was limiting myself by only writing to blogs and Facebook groups. I needed to be posting on Reddit, Ifunny, Imgur, Twitter, Tumbler, and even Instagram – Analoggames as an obvious example of how well Instagram works. The thing I learned is not to limit yourself when it comes to marketing, any publicity is good publicity. You just need to make sure you stretch your game to every nook and cranny you can find. I’m not trying to say you should harass your local Radio D.J. friend or your third cousin who once worked at Buzzfeed. But sending a quick link or a small submission to even the most unlikely sources can be a huge help. At this point we have just launched our KickStarter and my work has really just begun. I only have 28 more days to make this thing a reality. These past 4 months have been an amazing experience, it has shown me how if you follow through on one goofy idea you could actually end up making a game that people all around the world could play. I’ve learned that having supportive friends and family are a great motivation to bringing your ideas to fruition. Even if our KickStarter doesn’t get funded, I will take it as a sign that just more work needs to be done. Because in the end its all about learning from your mistakes and growing through them. I know that if I keep trying eventually I succeed.